Let's hope it only happened for today, but i doubt that. Cisco, one of the big companies in networking is rumored to acquire Skype. Here's an article on PCWorld that described why Cisco is doing it. 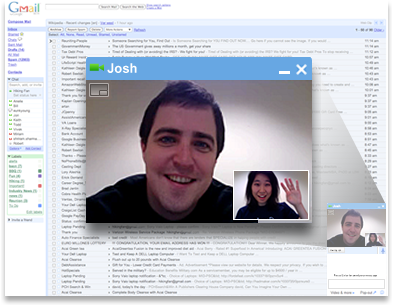 If Skype agreed to this deal, this would make the competition in VoIP between Cisco and Google become hotter as Google has just released their Voice and Video Chat plugins for Linux and they have done it for Windows previously. They even released Call Phone from GMail last week. Actually, i was really curious when 21Cinema decided to upgrade their online ticketing by adding a feature that enables us to select our own seat. This morning, i visited their website and i found the new interface which is confusing and i think 1.0 is better than the new 2.0. Bad at usability and too much pop ups and annoying ads. I'd say forget it. It's just an interface after all. But guess what? The functionality is even worse. I can't even buy a ticket and i have to do my registration all over again before i can use the new service (they even have my old data, why should i do the registration again). When i looked at their forum, i saw that there are so many people already complaining about it and the admin said that there were a maintenance phase and trial version before upgrading to 2.0 and they didn't even notify their users at all. I think they should be more informative to their users. In the past, i'm able to buy tickets since morning, but i think they have made the rule more strict, but no announcement on their buy tickets page. Conclusions: i'm so dissapointed with MTIX 2.0. Just go back to 1.0 and remove the seat selection feature. It's working and everybody's happy. have just came back from Gramedia book store with my girlfriend. We saw a very nice item there called 3D CubicFun, which was a cubic that resembles real places around the world, such as Tower Bridge in UK, Empire State Building, Capitol Hill, and White House in US, Eiffel Tower and Notre Dame de Paris in France, Sydney Opera House in Australia, Leaning Tower and Colloseum in Italy. I think those are great for gifts or to be used for education purposes, for example an estimation and scheduling workshop because we can set a time limit constraints to build the whole building. Linux kernel developers has tried so hard to improve desktop responsiveness by adding more patches in the current development version of 2.6.36. Phoronix has written an article about it. Even so, it will not be fully deployed in 2.6.36 and most of the patches will be pushed to the mainline kernel when merge window for 2.6.37 has been opened, which means that we will see those improvements next year, as one release will take about three months and it's considered too late to push this in 2.6.36 as Linus is very strict lately (which is good in some circumstances) about merging new features. Starting tomorrow, i will be teaching another CEH class for the third time on my campus as part of CEH Academia program held in UKDW. The participants are those whom are ready to take CEH classes as they have acquired basic understanding about security and i believe all of them are capable of finishing this course and get the CEH certification. Google has impressed me once again. After giving support for Voice and Video chat in Linux, they have just announced that you can call other people from GMail. They provide a very cheap rate which i think very reasonable. For call to US and Canada, Google will not charge you, but they will charge you for calls to other countries, but in a very special cheap rate. I had a good first impression about the new students who took the dual degree programs. Their English skills are good enough and i believe they have a strong background in order to finish their study without any problems. Tomorrow will be my first day teaching in Tuesday since last week my Indonesia's independence day, so no class. There will be three classes tomorrow, two project management classes and one class for Internet Concept & Infrastructure. The latter is my only class where all of the students are coming from 2010 class, so they are the new students that come to our campus. So far, i'm quite impressed with 2.6.35 Linux Kernel, since it's more stable and IMHO, it's much more faster rather than 2.6.34. But, looking fore 2.6.36 merge window information on LWN makes me more curious about what will be implemented in 2.6.36 which can improve performance on system overall. Around 6 PM today, there was an earthquake struck Jogja again. This time, it was 5 in magnitude. It's not as big as in 2006, but still it's big enough to make people panicked and ran away out of their houses. The epic center is near Jogja, so that's why the effect was tremendous, even though it should not that big since it's only 5 richter. Google has announced that they have implemented one of the top requested features in GMail: Linux support for Video Chat. Well, this feature has been available for Windows for some time and right now, Linux users will have the same feature as in Windows. Of course you will need a webcam in order to use this feature. Of course you will have to download the Google Voice and Video Chat applications first by visiting this site. For now, only .deb files are provided, so Ubuntu and Debian-based Linux distribution will be very happy about this. RPM-based support will follow soon enough. Finally, Blogger has added spam detection on their system. Well, i don't think it's really a spam detection as it relies on user's intervention to say that it's a spam or not, but i think it's much better than previous one. All you need to do is to activate comment moderation on Blogger (go to Settings > Comments > Comment moderation). When you activate this feature, you will have a new tab called Comments besides Posting (under your Blog name), where you can moderate all comments that goes into your blog and you can mark them as spam or even delete them. This is a standard feature actually, but what Google does is to add an automatic spam detection for every comments that goes into your blog. As i stated yesterday, first Ubuntu maintainance release has been available for public consumption and last night, i have finished mirroring Ubuntu 10.04.1 and Kubuntu 10.04.1 on UKDW's ISO Server. I only provide ISOs and MD5SUM files and not the rest. When Greg released -Stable kernel updates few days ago, he didn't say that there was a very serious bug lurking in the kernel that has been passed down since 2.6.0 release that has been fixed. It was Linus who wrote the patch for 2.6.36 and goes back to previous kernel releases maintained by Greg as part of -Stable updates. Joanna Rutkowska, founder and CEO of Invisible Things Lab posted a blog post about this problem after her employee Rafal published a paper describing about the problem. I'm sure many of Linux vendors will release an update to their kernel stocks by adding Linus' patch to make sure it's not being exploited by attackers. This release has fixed several problem found on the original release of Lucid Lynx and most problematic packages has been replaced with the fixed one. This should be the recommended version for people who wanted to run a stable version of Ubuntu. If you have used synaptic or apt-get to upgrade your local packages, you won't need to install anything as your upgrade has included all the fixes included in this release. The Narwhal, as an Arctic (and somewhat endangered) animal, is a fitting reminder of the fact that we have only one spaceship that can host all of humanity (trust me, a Soyuz won’t do for the long haul to Alpha Centauri). And Ubuntu is all about bringing the generosity of all contributors in this functional commons of code to the widest possible audience, it’s about treating one another with respect, and it’s about being aware of the complexity and diversity of the ecosystems which feed us, clothe us and keep us healthy. Being a natty narwhal, of course, means we have some obligation to put our best foot forward. First impressions count, lasting impressions count more, so let’s make both and make them favourable. Remember, you will have to install GreaseMonkey add-on for Firefox first before using it. In the past, we have BrowserShots to verify our websites in several browsers. It is very useful for web developers who wanted to have an unified design in all browsers. What i want to share right now is another service, but for different purpose. We are not talking about web pages, but documents. Yes, we have quite several alternatives to Microsoft Office which is still considered a de facto standard in many plances, such as OpenOffice.org, AbiWord, KOffice, and many more. If you want to compare your documents when viewed in other applications, you don't have to install them in your computers. Just go to OfficeShots and upload your documents there. The site will compare your documents. Pretty cool isn't? Tomorrow will be a new start for new semester. This time, new students will start learning in campus and existing students will continue to finish their education in undergraduate program. I'm quite lucky to be selected as supervisor for 2010 students, meaning that i will have monitor and track their progress right from the beginning until the completed the undergraduate program. This will be my first experience. Even though i will not teach them directly since i only teach subjects which should be taken by second or third year students, i have an opportunity by teaching in IDDIT (dual degree program) in which i will teach Internet Concept & Infrastructure. This is a basic course and all of the students will be 2010. I hope this course will give a good introduction to Internet and most of it's applications so that the students can take positive benefits of it. My schedule is not that tight this semester. I only have four subjects to teach: Advanced Software Engineering, Operating Systems, Internet Concept & Infrastructure, and Project Management. Other than this, i will also teach CEH (Certified Ethical Hacker) class. My office have a five days working policy since few years ago, but today is an exception. I had to attend two thesis presentations in the morning. One of them is under my supervision. I was satisfied with the results. Both of them passed the test and got a good grade as the results. I think it's worthed to come at Saturday, working and at the end, getting a good results. I had a busy day today. Starting from early in the morning, i arrived at my office at 8 AM, because i thought i had to attend a thesis presentation at 8. My bad. My session was supposed to be at 10 AM, so i had to wait for two hours. I spent by chatting with my colleague, Riyono for about an hour and finally my session started at 10 AM. After the first session finished, i had to attend Yudisium in 12 PM until around 12:40 PM. My students asked me to come to D.3.1 to talk about the UKDW NetClub event which will be started at 1.30 PM. I rushed there and have a chat with some of the students before i came back to my office at 1 PM because another presentation has begun. This time, it finished early, so i had some time to go back to D.3.1 to give unprepared talk session in front of the new students about opening their minds to many kinds of alternatives. One of them is using Open Source applications. I only gave 10 minutes of speech, since at 3 PM, my third session has commenced, so i got to go back to my office to do the hearing and QA session with the students. It all ended at 5 PM. I received an email about CEH training with Haja Mohideen, the author of CEH certification program, but unfortunately, the schedule is not friendly to me. This semester, we will have so many day off on Tuesday, so that means i will have to find another day to hold the class and i don't think i can miss another day off (national day off have accumulated into three Tuesday). I picked up my mother this evening from airport. She was coming back from her trip to US to take care of my grand father. She called me today from Jakarta saying that she's coming back today so i had to pick her up. She brought my wish list, which is an external (not so) portable HD from WDC which has 2 TB of capacity (1,81 TB in reality), which is enough to save huge amount of data for now. I asked my uncle in the US to buy it for me since it's cheaper if the item sent to local address rather than shipping it to Indonesia directly. This week is full of surprises from OpenSource application. Started by OpenOffice.org who has just released their first BETA release for the upcoming OpenOffice.org 3.3.0 which will be released later this year (i think it would be in October/November if there's no major showstoppers). Ever since Oracle has acquisited Sun, the OpenOffice.org has changed their logo in the splash screen and i think OOo 3.2.1 has been a great release. Many improvements has been integrated on that release and i found many people enjoyed so much. It's faster, better, and more stable than before. Next is KDE SC 4.5.0. Even though the release date was slipped for a couple of days, it doesn't mean the fun has ended, as finally the final KDE SC 4.5.0 has been released by KDE Team. The announcement said that they have fixed more than 16000 bugs since 4.4.x series, which are an outstanding achievements. I'm looking forward to see the new KSharedDataCache which was supposed to make loading time faster. New Webkit support is also interesting to try. I don't know how long have i abandon my Windows system on my desktop since i used Linux all the time, but today i rebooted to Windows and it seems that i missed so many security patches from Microsoft and also many of my applications were considered outdated. So i decided to upgrade all of them and it does take some time. Although Chelsea vs MU match wasn't broadcasted in Indonesian local TV except for those whom subscribe for paid channel, i'm relieved that MU finally got their 18th title of Community Shield after an impressive victory of 3-1 against Chelsea in Wembley Stadium, London. New semester will start next week (starting at 16 of August) and as usual, my schedule is quite busy for this semester, so i have to finish my task before the class started. Starting from this week, i will start preparing the materials. I'm updating the syllabus for advanced software engineering classes and also i have to make a new material for Internet Concept & Infrastructure class as it will be my first experience teaching that course. EPL will start again starting next week with Chelsea and MU will start the competition in a community shield event. Both team has finished their pre-season matches and so far, both are satisfied with their squads, even though no star players for MU this season. I don't think buying a star player will increase your performance significantly. Take an example of Real Madrid. Even though they have bought C. Ronaldo and combine him with other talented player, in the end, they couldn't get anything this season. Lately, i have some problem accessing websites using Speedy. I had to refresh several times before it got connected. I'm suspecting that DNS server that Speedy has right now are having some problems resolving some websites. Most of the websites are foreign websites, and it's not a problem when i browsed local content. Star Craft 2 is now officially available for public and what's great about it is that it works with the latest stable Wine release (1.2). But, according to this blog, it's recommended that you install or upgrade to Linux Kernel 2.6.35 and upgrade your NVidia/ATI drivers to the latest version before trying to run the installer, as it will fix some problems if you used older kernel/drivers. I'm not a big fans of Aang the Avatar, but i do really hoped that the movie would be a good one as i didn't read the books about him. So, i decided to buy two tickets to watch it this evening with my girlfriend. The movie has 100 minutes of duration, so it's not that long. I would give 7.5 out of 10 for this movie. I know, the news were out two days ago, but since i was away and i couldn't find any good Internet connection while i was away , i had to postpone until today. Well, finally i'm back at home today and i wanted to tell you that Linux Kernel 2.6.35 has been officially released by Linus Torvalds on the first of August. You can see the big changes in KernelNewbies. Following Linux Kernel development is very interesting, as you will see many debates on it, but in the end, people are glad to have the new version comes up. Meanwhile, Greg has released (finally) some updates on -Stable kernels. People (as usual) are urged to upgrade to the latest version to fix problems found on previous version of the kernels. One interesting news is that Greg stated that 2.6.34 will not be maintained for a long time and people who still used 2.6.33 should upgrade straight to 2.6.35 instead to 2.6.34. That's surprising, as 2.6.34 only received two updates since the release, which is very rare. For me personally, i would like to stay in 2.6.34 a little bit longer, as i'm not sure whether the NVIdia driver that i used now is compatible with 2.6.35 or not. Also, VMWare hasn't released any update which is known to work with 2.6.35 also. These two are my two blocker before i decided to go with 2.6.35. OK, back to mIRC. So in 2008, the development of mIRC has started to work on unicode support and finally two years later (which is this year), they have finally fulfilled their dreams of having unicode-supported application which should run better in Windows platform, including Windows 7. It also supports for speech, IPv6, UPnP, and many other features described in their Changes page. I'm leaving to Bandungan early in the morning tomorrow for a university meeting at Susan Spa Resort. It's a nice place and it will be my first experience going there even though i have been to Bandungan several times. It will be one night trip only, so i will be back on Tuesday night.